"Counting Small-boned Bodies by Robert Bly: In the poem, Bly refers to the number of deaths of the enemies during the Vietnam war. Bly is referring to the United States winning due to Vietnam having a higher body count of deaths after a battle. "Friends" By Tim O'Brien: Dave Jensen and Lee Stunk, who were soldiers in the war, had a difficult past with each other. But, overtime, they began to trust each other and started to watch each other's backs. However, one day Stunk steps on a mortar round and it took off his leg. Unfortunately, Stunk died on the way to the hospital and Jensen felt a huge weight lift off his shoulders, he no longer had to care for him. In the poem it states, "Let's count the bodies over again" (Bly). This particular message is important because it sums up the Vietnam war in a sentence. The United States used body counts after battles to declare who won. The United States fought for nothing, the war didn't change anything besides people who were alive, ended up dying. In the text it states, "Then he panicked. He tried to get up and run, but there was nothing left to run on. He fell hard. The stump of his right leg was twitching. There were silvers of bone, and the blood came in quick spurts like water from a pump" (O'Brien 63). 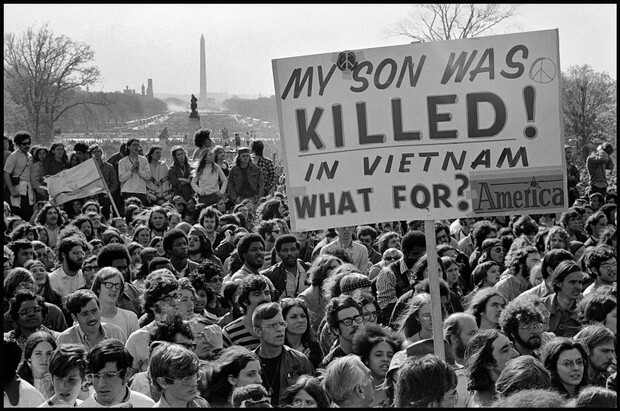 This particular message is important because it shows how emotionally and physically damaging the Vietnam war was or how damaging war is to people in general. Innocent people were killed over nothing, the quote and passage show why people were completely against the war and why the United States shouldn't go to war. In the poem, Bly is trying to convey to the readers that it is not worth it to go to war. People are dying over something we cannot control, he wants the readers to realize how many innocent lives were taken due to the war. The war impacted the soldiers by emotionally making them unstable, due to the trauma they experienced. It even impacted some soldiers physically by losing limbs or their lives. Not only did it impact soldiers, but the war impacted Americans who were watching the war go on from their T.V. The war turned Americans against the soldiers and the government due to the brutality. The poem by Bly is also antiwar, the poem influences people to be against the war too. In the chapter "Friends" by O'Brien, the message the author is trying to convey is how much weight and baggage the war put on the soldiers. They had to worry about their own lives and the lives of others. There was so much going on, losing one friend felt like a weight being lifted off their shoulders because it was one less thing they had to worry about. In addition, the war impacted people emotionally and physically, whether they were in the war or not. This picture reflects aspects of the Vietnam war because during that time period, majority of Americans highly disagreed with what was happening in the war. Innocent people were dying and Americans were able to witness it from their T.V screen, therefore, there were many riots and protests against the war and the deaths of the fallen. In class and in the readings, we've learned how much people hated the war through discussions and poetry. Also, how emotionally damaging it was for the soldiers to be there throughout the chapters of O'Brien's book. War by Edwinn Starr is an antiwar song that came out when the Vietnam war was going on, the song discusses how pointless the war is. The war didn't help anything, it just hurt the families of the loved ones who died in the war or were injured. The song connects to the poems we have read in class because majority of them were antiwar and discussed how badly Americans wanted peace. 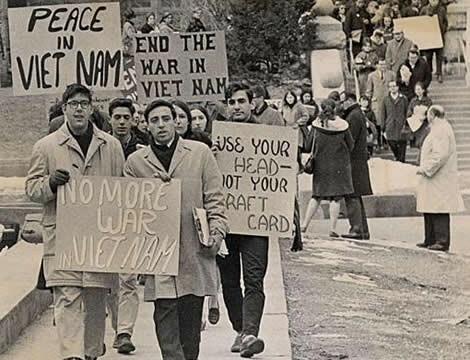 Also, antiwar protests have come up in conversations during class and why Americans were against it.